I know I said last week that I love snow, and this is sort of still true, but I'm getting to a point where I've got enough of it. 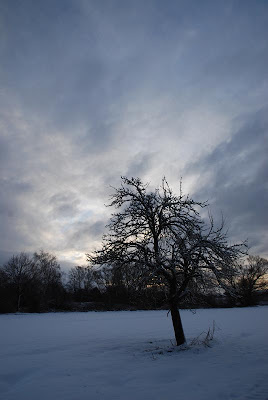 Usually, our winters are wet and miserable, with temperatures hovering just about freezing and some wet, cold rain. There's usually one, tops two weeks of real snow and real cold temperatures, but this goes usually away pretty quickly. Though, I have to admit, it does look pretty. 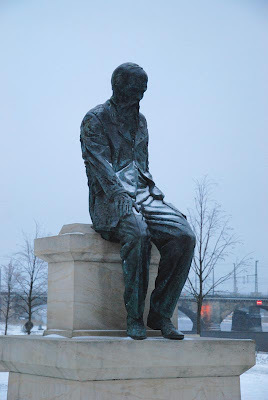 A figure of Dostojewski in Dresden. Trees just a short walk away from home. Still knitting socks, so my feet are staying warm. We did brave the snow yesterday and saw the new Sherlock Holmes movie with Robert Downey Jr. and Jude Law. Great, great fun. I'm tempted to give it a repeat viewing. Good story, great acting and the rest was also just right. Loved it. So far it's been a very cold winter, though, to be honest, I don't mind. 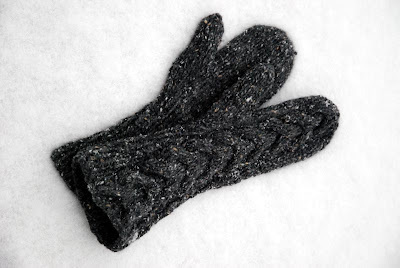 A) I like the snow, it's pretty, and B) I've got plenty of knitting to keep me warm. 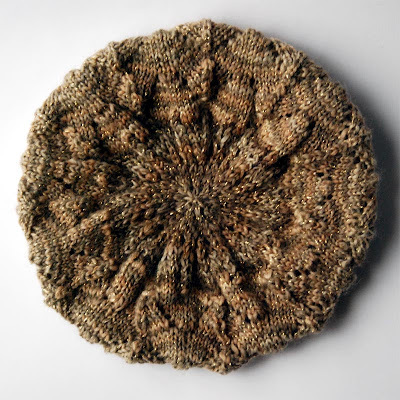 The pattern for this Beret is called Meret as it used to be a Mystery Beret. Now, luckily, the pattern is available for free. It was a very fast knit (two movies). The yarn is some really old stash yarn I got in Holland ages ago. There's a golden threat running through the yarn, which adds a little bit of umph. 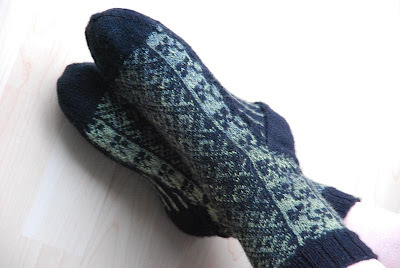 Also, the second 2010 pair of socks is finished. Remember my experiment in dying in October (--> link) ? I finally knitted some socks with this yarn and I love the color. Only ... it's not colorfast - my hands were always green after knitting. I tried a trick to fix that I've found on Ravelry, but I might have lost some of the definition in the colors now. Ah well, it's still a pair of nice green socks. From the leftovers I had after knitting the big squared bag (--> and another link) I've knitting up a smaller bag, but still need to felt it and decide which handles I'm going to us. 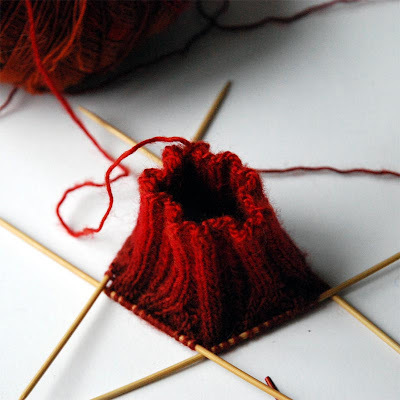 And I've already got the next sock on the needles, Angee from Cookie A's book Sock Innovations. Not very far along right now, but I've sadly managed to break two of my beloved 2mm Knit Pro dpns (stupid me that one). Luckily I've got a bamboo set as well, so I was able to continue. 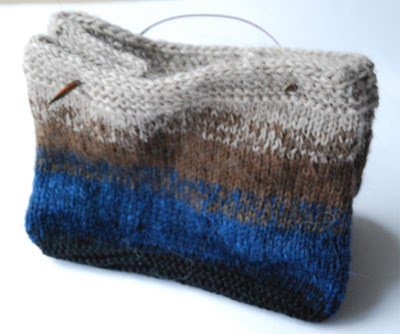 I've used Regia hand-dye yarn for the green and I like the effect of if a lot. 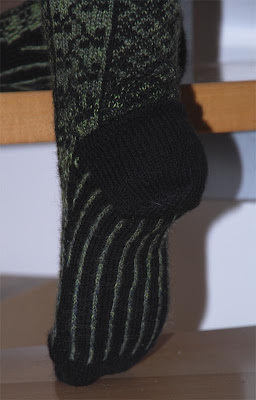 The black was a close call - in fact I did run out of it on the toe of the second sock, but luckily I found a small left over in a different project, so I didn't even need to buy more. I've made progress on the Central Park Hoodie, but am currently thinking about ripping it up and knitting it a again on a smaller needle. The problem is that I like the feel of it before washing, but after washing the yarn loosens up a bit and I'm not overly fond of the drape of it. I think a smaller needle size could change the problem. One of the pattern I've been wanting to knit for quite a while now is the Central Park Hoodie. It is an immensely popular pattern, especially if one considers it's not free. Currently over 3000 people on Ravelry have knitted this cardigan up and almost 5000 more have it queued with the intention to knit it up one day. I did queue it a year ago, but it took me forever to decide on the yarn I'm going to use. As I'm not living in the US, most of the substitutes are not really doable for me, and I wasn't really happy with the options I have here. Now, finally, I've decided on a yarn called 'Lord' by Lana Grossa and using the last of my vouchers from my birthday, I didn't even crinch too much about the money. 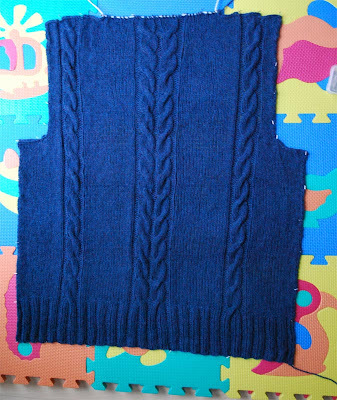 The pattern knits up fast, and I finished the back already. After washing and blocking it did grew a bit, though I have yet to see how it will behave after drying. 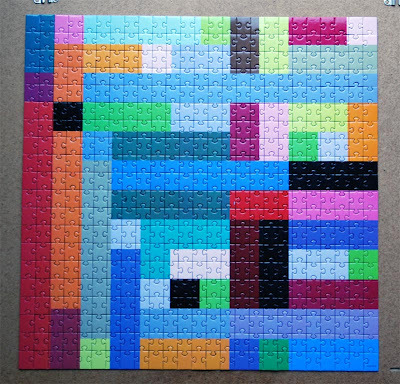 My current interest in jigsaw puzzles had me dig up an older puzzle I've bought years ago with the intention to give it to Bill one day. As this is not going to happen now, I've decided to put it together myself. 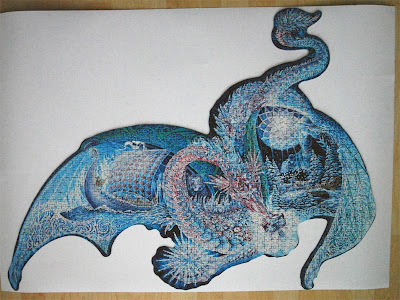 It was quite tricky and I did curse a few times, but eventually I managed to put all 1.000 pieces where they belonged. I hope everybody had a good start into 2010. It has been a rather productive year, knitting wise at least. I just counted my finish projects and am quite impressed by myself. 2010 already saw two finished projects. 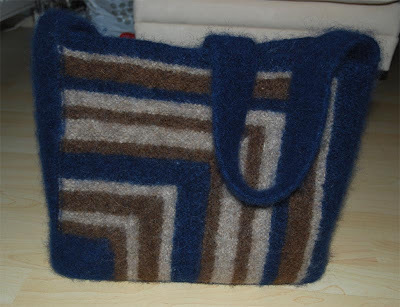 The mittered stripes back was finished knitting in 2009, but the sewing together and the felting was done in 2010. I did block it using old video cassettes which worked great and I'm very happy to see it does stand up on it's own. I does shed a bit, still, though. The felting made it shrink by 10 ~ 15%. I would have liked a bit more, but ah well. The gloves are 100% a 2010 product. I *did* start on the 31st, but had to rib everything up again. The turned out to be rather small, but they are perfect for me. 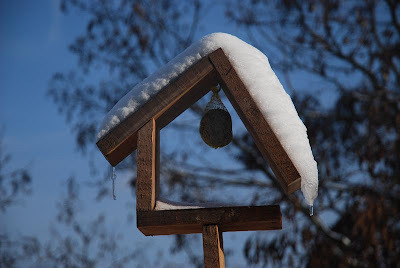 As it snowed today, maybe they will so some action today already. Other than that, my mom got me back onto jigsaw puzzles. This 500 pieces puzzle was fairly easy, but now I'm on another one that's somewhat harder.